This giant dog breed, nicknamed the Beast from the East, is one of the four strongest dogs in the world. If you’re a big dog enthusiast like me, you may fall in love at first sight. However, these dogs aren’t for everyone. To ensure this breed goes into the right homes, I’ve gathered all the information you will need to help you decide if the Bully Kutta is for you. How Did the Bully Kutta Come to Be? What Does Bully Kutta Mean? For What Purpose Was the Bully Kutta Bred? Poor documentation has led to many theories and arguments being made, relating to how this breed was developed. The most logical and popular theory states that the Bully Kutta originated in India or Pakistan in ancient times. Due to the resemblance, many say it was crossbred from the Sindh Hound and molosser breeds like the Alaunt. They are viewed as the purest descendant of the Molossian Hound. Again, there are theories on how it got its name. It is highly likely though, that the dog was named ‘Bohli’, due to it meaning “heavily wrinkled”. Excess skin, especially under the chin and around the neck, is a distinctive characteristic of the breed. ‘Kutta’ means “dog”. 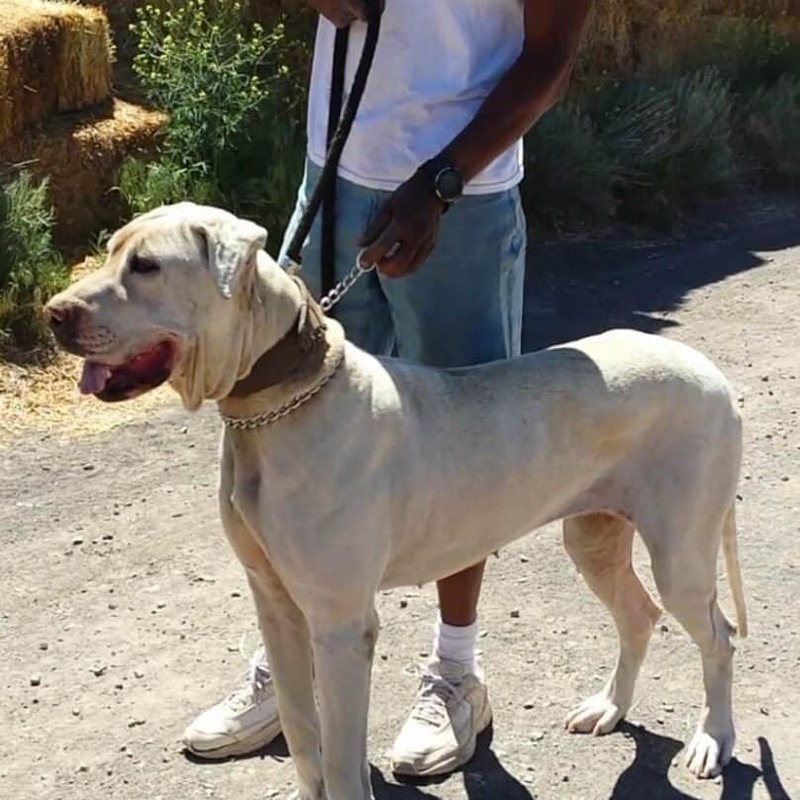 An adult male Bully Kutta stands at an impressive height of 30 – 44 inches (76 to 111 cm), and weighs between 150 lbs – 170 lbs (68 to 77 kg). Females are between 28-36 inches (71 to 91 cm) and 130 lbs – 150 lbs (59 to 68 kg). Both have a lifespan of 8 to 10 years. Their coats are smooth, short, and straight. The breed is mostly white but is also common in white and black, fawn, harlequin, white and brown, black, red, and brindle. As mentioned before, the skin is wrinkled. It is thin but tough and the color is black or speckled. They have a huge head and a black muzzle. The loose lips expel gallons of drool daily. Well, maybe not gallons, but they do drool. The Bully Kutta also has a large, broad chest and tall, lean legs. It walks with the graceful gait of a lion, and a gently swaying stride. Its long tail is held high and tapers to a fine point. In Pakistan and India, dog fighting was popular. With great stamina and its aggressive personality, this fearless and powerful dog made it the number one choice for battles. 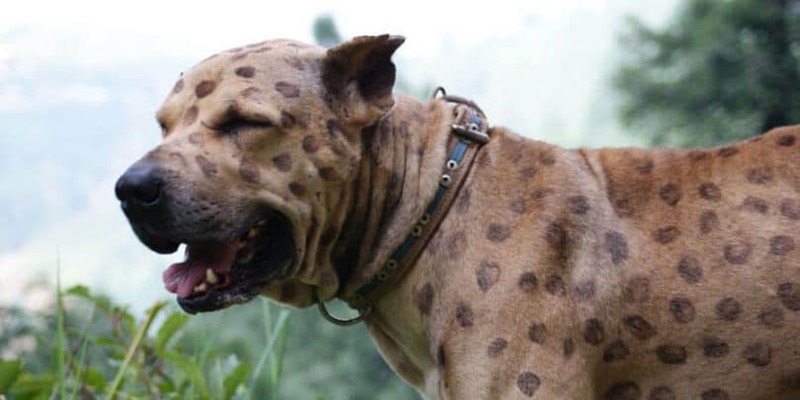 They were bred to fight to the death against other fierce dogs like the American Bully Dog, Pitbull, Kangal, Rottweiler and the Tibetan Mastiff. Watch the video below to see how the Bully Kutta compares to one of its rivals, the Gull Dong. Hunters used the Bully Kutta to help them capture large game like bear, tigers, water buffalo, cheetahs, and lions. Some years ago a law was passed prohibiting dogfighting. Though it hasn’t been completely eliminated the Bully Kutta has been able to take on other purposes. Now some spend their days guarding people and livestock. So if you need protection or area rancher, this breed might be right for you. 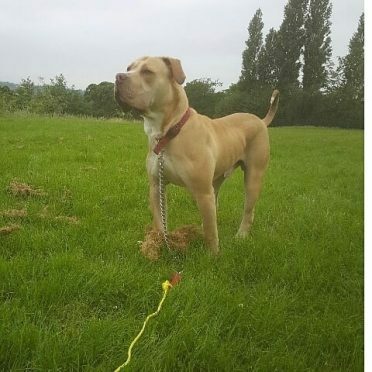 As a highly intelligent and dominating breed, the Bully Kutta needs the right owner in order to thrive. With proper training they are responsive, fast learners. Due to their size, it is necessary for them to have a large living space. The Bully Kutta also requires regular exercise since they are energetic. However, they can be lazy and sleep all day if they become bored. It’s important to keep in mind that a bored dog is a destructive dog. Imagine how destructive a 150 plus pound dog can be. If you are considering getting a Bully Kutta, be prepared to provide, at a minimum, 60 minutes walk or run per day and 12 miles per week. At home, they have a good personality, are loyal, devoted and protective of their family. When raised with, or socialized early, they are loving and playful to other dogs, puppies, and children. Territorial and fearless, the Bully Kutta is always on alert and guarding their premises against unwelcome guests. Remember, as mentioned earlier, these dogs were bred for fighting, so they can be very aggressive. They may bite first and ask questions later. So caution should be taken when new people and animals visit. Some countries, such as the U.K., have laws that banned the ownership of certain bully breeds due to the danger involved. If you live in one of these countries, it is likely that the Bully Kutta will be found on its list. Watch a short video of the Bully Kutta in action. You will see just how fierce and massive these dogs can be. Hip dysplasia and arthritis are common in large and giant breed dogs. The Bully Kutta is no exception. Provide your dog with daily exercise. I can’t mention this enough–it’s that important. As a moderate shedder, they only require rare to occasional coat brushing with a firm bristle brush. No hair clipping is necessary. You MUST be a firm and dominant owner or leader. You MUST achieve a pack leader status. This is a headstrong dog that WILL take charge if you don’t show him who’s boss. Proper, consistent training will make an obedient dog. Love and affection from its owner are equally important in developing a well-rounded dog. Socialization at an early age with other adults, children, and dogs, will help your Bully Kutta become a trusted member of the family. To help ensure a long, healthy life, high-quality dog food and snacks should be provided daily. This can be expensive since the dog is so large and requires around six cups of food a day! Puppies for sale through breeders are easily found in Pakistan and India in populated cities like Chennai and Bangalore (Bengaluru), Delhi and states like Kerala. However, they are rare in other parts of the world. They’ve just recently been imported to China, Russia, USA and Central Asia. Breeders in the US are hard to find. I did find one in Texas. Here is a link to their facebook page: https://www.facebook.com/BullyKutta2012/. They appear to be the only breeder in the US right now. Obviously, the cost in India is less when compared to the US. They can be found in India for as low as $300 US, with the average being $500 US. A well-bred pedigree puppy bought from a reputable Indian breeder can be as high as $900 US. Puppies between 8 to 12 weeks need 4 meals daily. Pups 3 to 6 months old should be fed 3 meals in a day. Feed pups six months to one-year-old 2 bowls of food per day. Giant breed puppies are small and cute when they are born but they grow fast. When adding a Bully Kutta to your family be prepared to welcome in a dog that will weigh as much as an adult human. It is very important to work on training and socializing your puppy as soon as they arrive home. This is the key to good behavior in the future. The breeder should have already started working with the pup. Be sure to ask about this. It is important enough to mention again that this dog needs a dominant trainer. They are not for first-time dog owners. They will not listen or obey timid people. In the right hands though, they are fast learners and will build a strong bond with their pack leader. With the elimination of dog fighting, the Bully Kutta will need to find another purpose in life. While I strongly agree that this dog is not for everyone, it would be a shame to see it become extinct because it is no longer wanted or needed. I believe all dogs deserve the opportunity to prove themselves. 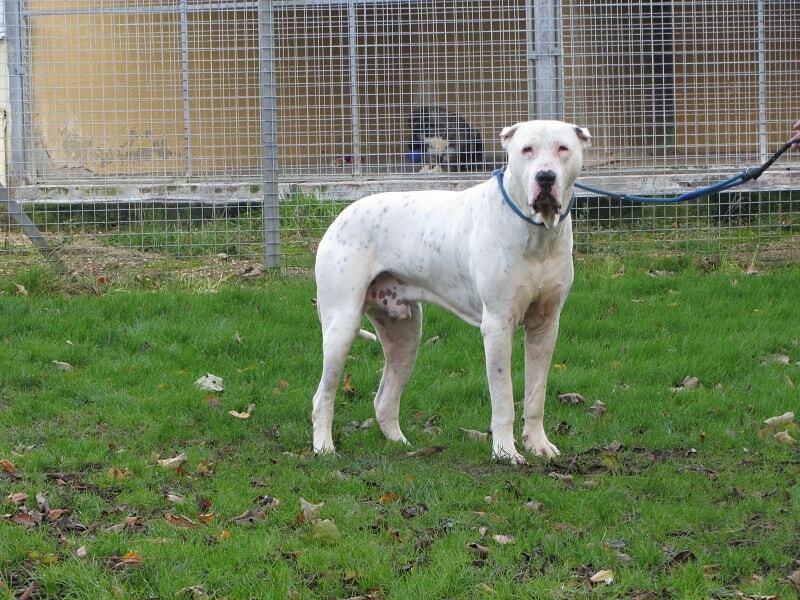 Stepping away from the fighting ring will allow the Bully Kutta to show its loving nature. Do you have any questions or comments about the Bully Kutta? Share them with us in the comments below!